There is a fine line between thinking something through and overthinking. 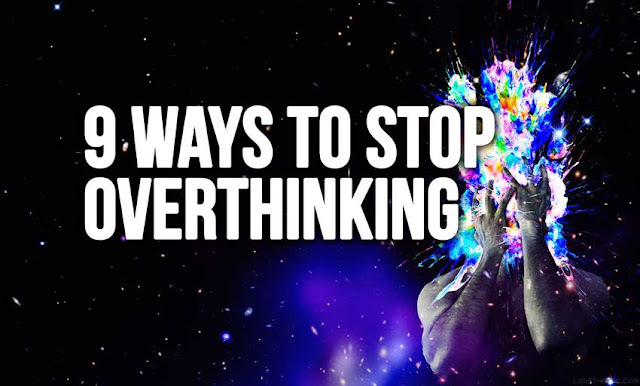 The problem is that not many people manage to control their thoughts efficiently and easily fall into the trap of overthinking. This kind of behavior can do more harm than you might think because it does not only prevent you from enjoying the present moment, but also deprives you from making an adequate decision that is not dictated by fear or misjudgement. Here is a list of ideas on how to escape that mind-trap. Giving yourself a set amount of time for decision making is a great way to avoid overthinking. Usually, when we are trying to decide what to do, whether or not to do something, we let our minds wonder and explore all the possible outcomes of the potential choices. This isn’t necessarily a bad thing but often the decision making process can keep on going for an excessive amount of time. Not only does this prevent us from taking action, but it also is a sure way to waste our precious time. So, next time when you catch yourself struggling with making a decision, give yourself a time-limit. For example, when it comes to a small decision, give it 1 minute to decide and when it comes to a big one- till the end of the day. This strategy is definitely worth trying because it’s simple and saves you some time and headaches. Giving yourself a break when you feel like you are not thinking straight helps a lot. We all have our moments of uncertainty and instability. In such times forcing yourself to think of a solution to a problem or making a decision can be really overwhelming. Taking a break from the negative thoughts by going for a walk or taking a nap can improve your thinking process significantly. You will feel refreshed and will be able to resolve the issue you were struggling with easier and more sufficiently. Too many people nowadays are struggling with procrastination. Maybe this is because in the age we live in there are so many potential distractions that our minds get easily attracted to and fall into the trap of constantly delaying the work that should be done. But procrastinating can also serve you as an excuse to overthink different scenarios and situations and that can drain your energy really fast. This issue is not an easy one to resolve because it requires a strong mindset and tons of determination. But if you manage to actually become a person of action and fight the unresourceful habit of procrastination, you will not only have rarer occasions to overthink but it will also improve your life in many other aspects. So, train your mind into resisting the temptations that are distracting you and become a newer, stronger and more active YOU! What does a great job at fighting overthinking is working out. Practicing a sport or simply going to the gym can not only boost your health but it can also help you organize your thoughts. Working out regularly can help you arrange your time more efficiently and can strengthen your will and determination. You will feel more productive and won’t waste time thinking insignificant thoughts. WILL THIS MATTER A WEEK/MONTH/YEAR FROM NOW? Asking yourself this question can help you realize the level of importance of the issue you are struggling with. If it is not going to matter even a month from now, why do you worry so much about it? Training yourself to use that method in order to get a wider and more adequate view of your situation, will make it easier for you to let go of the useless stories that you are obsessing with. Being content in the now can help you stop overthinking because you will be focused on what you are doing and feeling right now. People usually think through things that have either already happened or things that can happen in the future. This is why practicing present awareness is so beneficial. What is more valuable than the present moment after all? Aiming to control everything that you can in your life isn’t going to take you far. On the contrary, it is more possible to hold you back. Thinking through something 60 times is a form of control obsession. When you catch yourself doing it, remind yourself that life is meant to be lived, not controlled or planned to the last detail. The sooner you realize that, the happier you will feel because even if you make a wrong choice or fail while trying to achieve a goal, you can always learn something new. And of course, next time you can try again more confidently and smarter. All the people that you look up to have failed at some point of their lives before they have achieved their dreams. And maybe thanks to these failures, they have succeeded. In many cases overthinking is caused by one emotion- fear. Falling into its mind-trap can cause big headaches and excessive worries. The sad truth is that fear controls many people’s lives. They are used to overthink the negative things that MIGHT happen to them, the ways that they can fail at life. This has unfortunately become an unresourceful thinking pattern that deprives people from unleashing their true potential and daring to dream big. If you recognize yourself in these lines, don’t worry. You have the power to overcome your fears and to do great things with your life. Next time you sense that you are falling into the trap of your fear and start getting obsessed with negative thoughts, tell yourself “STOP!” and think of what can go right, what you CAN achieve. Visualize your dreams and make them your motivation. We don’t always realize this but what we read, listen to, watch and who we hang out with have a great impact on our way of thinking. Be cautious with how you decide to spend your time. Choose books and blogs that help you be the version of yourself you have always dreamed of being. Overthinking can often be caused by things that influence us from the “outside” world. Hanging out with people who encourage you to grow and support you can really help with overcoming the habit of overthinking.